During March 2019, the School were visited by an assessor from Christian Aid's Global Neighbours team to review the school's commitment to being courageous advocates for change towards a world without injustice and inequality. St Luke's achieved the highest possible grading of GOLD - only the second school in the whole country to achieve this. This is a tremendous achievement which has been made possible by the way in which the children have responded to opportunities given to them within the school curriculum. The report commented that "upon entering St. Luke’s Primary School, you are quickly aware that this is a school which places support for environmental issues and finding ways to tackle injustice and inequality very much at the centre of what they do" and that "the interest and enthusiasm of pupils and teachers in relation to local, national and global issues is clear, both in and out of the classroom". Read below the assessor's report in full. As part of our commitment to ensure that all children are able to develop their critical thinking skills about the world around them and to discover the interdependence of the world around us and how we can all have an impact, making a positive difference, St Luke's curriculum ensures that all children have opportunities to think about their role as Global Neighbours across all aspects of the curriculum. More than 2 million people have been affected by Cyclone Idai in Mozambique, Malawi and Zimbabwe. To date, 480 people have been killed and an estimated 400,000 have lost their homes. These devastating tolls are set to rise in the coming days. Those affected are in desperate need of food, water, clothing, shelter and medicine. Aware of what was happening around the world, the children wanted to respond quickly and to help Christian Aid in their work. Thanks to their efforts and your generosity we have so far raised over £80. Our KS1 Eco-Warriors ensure that in our school energy is not being wasted unnecessarily. Each day, different children in KS1 make sure that lights and whiteboards are not being left on when classrooms are empty. They have also been checking that each class has a recycling bin and that it is being used correctly. Finally, they are making sure that if the heating is on, windows are not being left open. To find out more about are eco work, visit our Eco Team page. Reflecting our core value of thankfulness, we are using Christian Aid's 'Count Your Blessings' resources over the Lent period to reflect on all those things in our lives which we sometimes forget to be thankful for. At the same time, we are thinking of others in the world who our less fortunate and we are considering how, as Global Neighbours, we can help others to reduce the inequality in our world. By downloading the poster below you can also take time at home to think about our place in the world and our interdependence with others. Year 5 have been working hard to help protect orangutans. As well as leading a whole school presentation on the dangers that palm oil creates, they have raised money to adopt orang-utans. Their donation has gone towards supporting the Sepilok Rehabilitation Centre to care for those orangutans who have already been affected. Well done, Year 5! Some of our Year 5 children have raised £180 from their cake sale. This money will go towards helping those orang-utans whose habitat is threatened by deforestation caused by the need to produce palm oil. This follows on from the presentation they did to the school about how the plight of orangutans around the world. Key Stage 1 have been learning about the impact of global warming and what they can do to help. In their collective worship, children discussed what might happen to plants if our planet continues to keep getting warmer. In lessons, Year R looked at what happens to ice when it gets warm and what this might mean for the ice caps and for the animals that live there. Year 2 had an Arctic explorer visit and talk to them. He spoke about how scientists are checking the impact on the North Pole caused by global warming. Being a good global neighbour is more than just feeling sorry for people who are suffering from misfortune - it is about making a difference to their lives. One way this can be done is through courageous advocacy. The children have been developing their advocacy skills by directly engaging with decision-makers across a range of issues. Two letters were written to the Prime Minister, Theresa May: one about deforestation and renewable energy, and the other about pollution. The School Council have been thinking about lots of ways to encourage children throughout the school to be active Global Neighbours. The Council looked at different schemes for collecting unwanted clothes and decided that the Salvation Army's 'Recycle with Michael' was an ideal charity to support. Members of the School Council led a whole school collective worship to kick-start the project. See below for their Power Point. To find out more about the work of the School Council, follow the link below. This year's Christmas Service considered what we can learn about being good Global Neighbours from the Christmas Service. We thought about how the last innkeeper was willing to help others in need when it might have been easier to ignore rather than to help, and how the three men from the East show us how to follow God's Word to oppose cruelty, unfairness and selfishness by being courageous in our advocacy of justice and equality, just as Jesus also did throughout his life on Earth. The School Council also decided that the collection from the Christmas Service should go to the World Wildlife Fund. Read below the Christmas Prayers that the children wrote. As a school, we have always tried to promote an ‘international mindedness’, encouraging children to reflect on our place in the world. 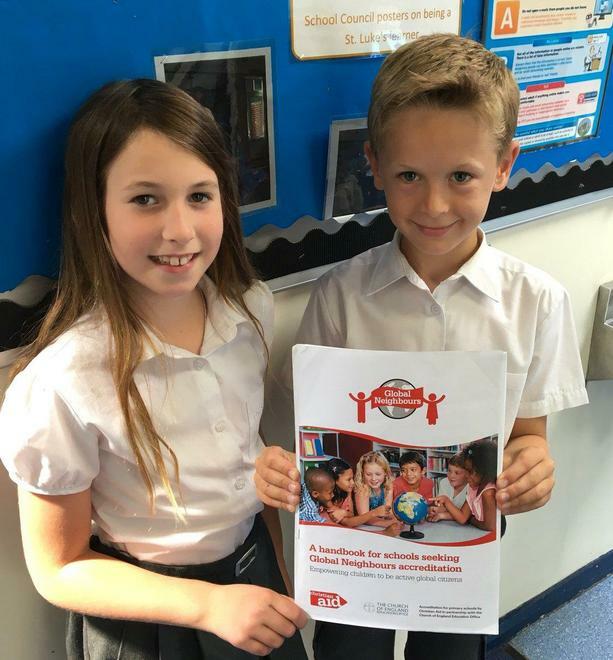 By taking part in the Global Neighbours scheme run by Christian Aid, we want to help everyone in our school family become courageous advocates for the common good, locally and globally and in doing so, encourage a deeper understanding of global injustice and how we can all become active global citizens. In our Harvest Service, we shared how Christian Aid has helped lots of people around the world. Children at St Luke's decided that the collection of £187.72 from the Harvest Service should go towards a project supported by Christian Aid: helping crab farmers in Bangladesh.